Because weather conditions in southern Alberta tend to be dry, hot and windy in the summer, homeowners in the area need to be extra cautious about fire prevention. Builders of custom homes in Calgary offer a wide range of systems and technologies that reduce fire risk. Take advantage of them if you’re thinking about building a new house! 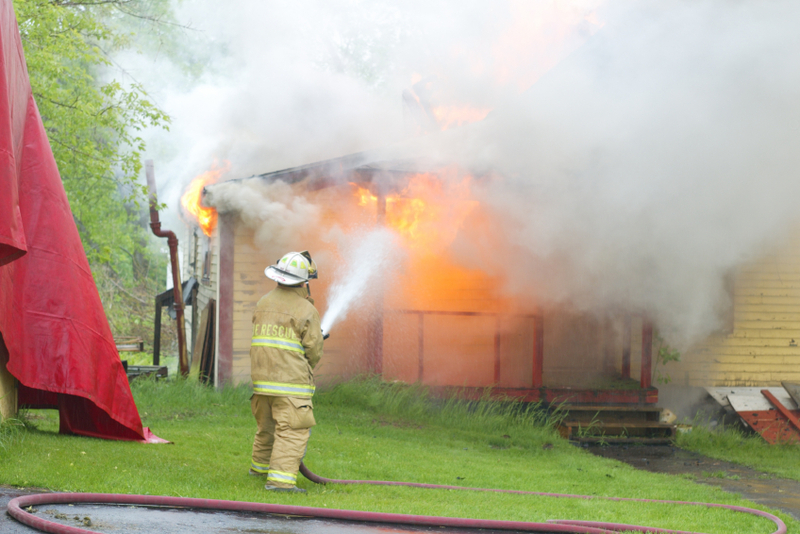 Home fire detection and prevention goes far beyond installing smoke detectors and fire alarms. Built-in sprinkler systems, specialty insulation products and uniquely designed roofing materials can all be used to keep your family safe and protect the investment you’ve made in your new home. Indoor sprinkler systems. Because it’s so important to act quickly to contain and control a house fire, indoor sprinkler systems provide a vital level of protection. These systems are designed to detect sudden, dramatic increases in temperature, and will automatically turn on in the area where a fire has broken out. Because they use far less water than a fire truck, they also help reduce water damage. Fire-retardant insulation. Fine Line Homes always uses fire-retardant insulation, and new insulation technologies mean that you have more options than ever before when it comes to protecting your home. Cellulose and cementitious insulation are particularly adept at preventing and containing fires. Insulated concrete forms (ICFs). ICFs are becoming increasingly popular in residential buildings. These concrete foundation alternatives are primarily made from rigid foam insulation, which is placed in foundation panels and surrounded with concrete. Rigid foam insulation has excellent inherent fire retardant properties, and they also offer many other benefits over traditional foundations. Fire-resistant roofing. Specially designed fire-resistant roofs are available on all Fine Line Homes, and the company also offers a comprehensive range of eco-friendly roofing materials with outstanding inherent fire resistance characteristics. Metal, with its optimized heat resistance, is one of the best options if you’re looking for a fireproof roof that also offers a wide range of other energy-saving benefits. For maximized fire protection, opt to include all four of these technologies in your new home. Doing so may also help you qualify for reduced home insurance rates, as insurance companies will see that you’ve been proactive about fire prevention and may thus view you as a reduced risk. Install a minimum of one smoke detector per level in your home; ideally, each bedroom should have its own. Place the smoke detector high up on the wall, or on the ceiling. Always follow the manufacturer’s instructions in regards to proper placement. Be sure to replace each smoke detector’s batteries every six months. Conduct regular tests to make sure that all smoke detectors are working properly, and that all home occupants will be able to hear them should they go off at night. In the summer, you should be extra-careful when operating your barbecue. This is particularly important if you live on an acreage, as local fire departments may face delayed response times if they have to travel a considerable distance to reach you. Never barbecue too close to the house. Always barbecue over a paved surface; do not barbecue on your lawn or near a fire pit. Never use gasoline to start a charcoal barbecue. Be sure that all flammable materials are placed well away from the barbecue when it is lit. Never allow children to play near or operate barbecues. Keep a fire extinguisher within easy reach whenever you barbecue so you can react in case of emergency. Fine Line Homes is a leading Alberta-based builder of custom homes in Calgary and the surrounding area. As one of the country’s most progressive residential construction companies, we always leverage the latest technologies and incorporate eco-friendly and energy-efficient solutions wherever possible. It’s all part of the Fine Line Homes advantage. Clients can choose from an endless range of custom features and floor plans, and we invite you to explore our photo gallery to get a better idea of the kind of work we do. Building a custom home is easier and more affordable than you may think, and we provide complete support through every step of the process.